Looking for a Way to Improve Your ACT or SAT Score? Life gets busy and finding time to study can be hard, but with uScore, studying for the ACT and SAT can be done at your own pace. Our ACT and SAT practice tests, study materials, and videos are built to increase your test scores... guaranteed! Today's great high school students and athletes aspire to be tomorrow's college standouts. uScore helps these dedicated high school students maximize their collegiate opportunities by better preparing them for the ACT and SAT. Video lessons by expert ACT and SAT tutors are at your fingertips. We're so confident your score will improve, we guarantee it! Recruiting help is now at your fingertips! Follow these can't miss tips and score higher on your ACT! How can uScore help with your ACT and SAT prep? Our program provides desktop and tablet friendly ACT and SAT prep that's simple and effective! The best part? You can choose the ACT or SAT prep option that fits your schedule and your study needs. uScore is a unique online study program that offers the benefits of expert private tutoring without the hassle of weekly meetings or outrageous hourly pricing. We are the test prep solution for the high school student with a busy schedule and no time to waste on their ACT or SAT prep. How does the uScore Test Prep method work? Our program provides desktop and tablet friendly ACT and SAT prep that's simple and effective! Take one of our ACT or SAT practice tests, either online or offline, timed or at your own pace. 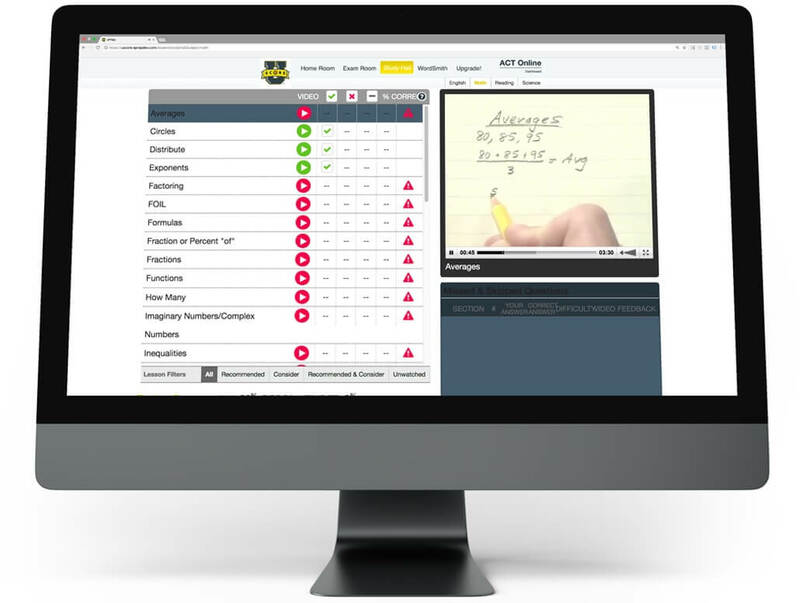 We provide instant feedback with video answers to each question and an in-depth video lesson on every section of the ACT and SAT. Every single question on all of our ACT and SAT practice tests offers a video explanation from our expert tutor as he walks you through every question, explaining the answer, how to get there and ways to navigate similar problems in the future. We also keep track of your review process for you, so you know exactly where you left off. Since we offer thousands of videos, you can watch and rewatch every video as many times as you want! You can pause and resume at your pace and go through every practice test however you choose. uScore keeps it simple and easy to review every question so you can get the most out of your ACT and SAT study prep. We even offer an ACT score guarantee. Take a look at some of the packages we offer to see which one best fits you. Sign up today and use our ACT or SAT prep all day every day, at your own pace, and on your own time. With all of our ACT or SAT prep packages, we offer unlimited access to practice tests with instant feedback, video answers and in-depth explanations for every ACT and SAT section. Depending on which uScore ACT prep option you choose, we guarantee that you will increase your ACT score 2-4 points! With our easy and effective online test prep, we can guarantee that if you stick with our ACT practice tests, and complete our 3-step process, you will increase your ACT score! uScore is an innovative, online, interactive program that helps high school students, including student-athletes, improve their college admissions and scholarship opportunities.